Pots & Co. is the brain child of Julian Dyer, he learnt to cook under the tutelage French chef, while working in London to work in top restaurants as well as his own, he cooked at prestigious and private events and while at one of these, guest were so enamoured by his raspberry cassonade with a caramelised pistachio crust that they suggested he went into business. Hello, Pots & Co. They're palm sized pots, that are suitable for quick deserts. Within their ingredients they use real devon cream and cornish sea salt ( just like I use on my face ). When I was asked to try these, I thought why not they had some interesting flavours within their range such as Lemon & Lime Posset, Strawberries and Cream, Sticky Toffee Pudding and including the one I was sent, Vanilla & Chocolate. Pots & Co. also do 'little pots'. 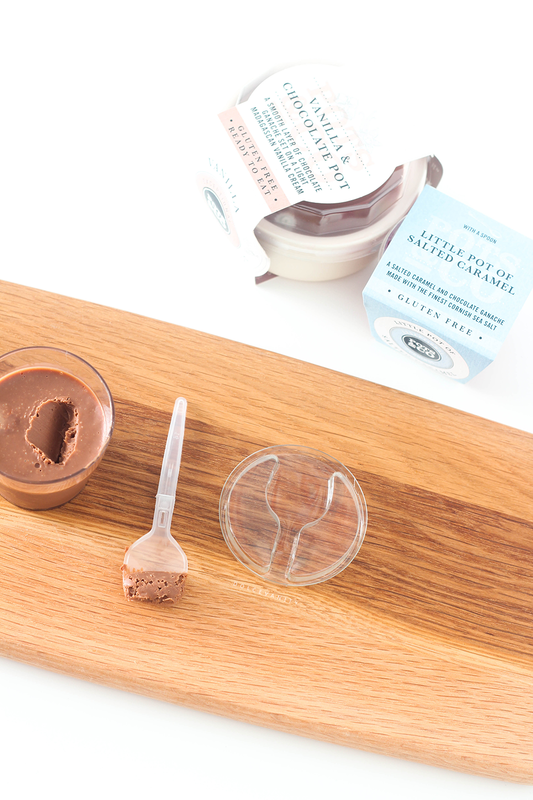 Little Pot of Salted Caramel, a salted caramel and chocolate ganache, made with the finest cornish sea salt. It comes in a 50g little pot with a plastic un-foldable spoon in the lid. Perfect to pop in for part of lunch at work, on the go or at a picnic. As you can see it's smooth and slightly sticky, I expected if honest a sickly taste but there's not of that at all, both flavours seem to be balanced and work well together. The spoon allows you to get enjoy and eat more than if you was to use a larger spoon. If you do enjoy salted caramel this is one to try. Ingredients : Whipping Cream (Milk) (25.5%), Milk Chocolate (25.5%) [Cocoa Mass, Cocoa Butter, Whole Milk Powder, Sugar, Emulsifier: Soya Lecithin, Natural Vanilla Flavouring], Double Cream (Milk) (17%), Dark Chocolate (9%) [Cocoa Mass, Sugar, Cocoa Butter, Emulsifier: Soya Lecithin, Natural Vanilla Flavouring], Whole Milk (9%), Free Range Pasteurised Egg Yolk (5.5%), Sugar, Butter (Milk), Glucose Syrup, Sea Salt. 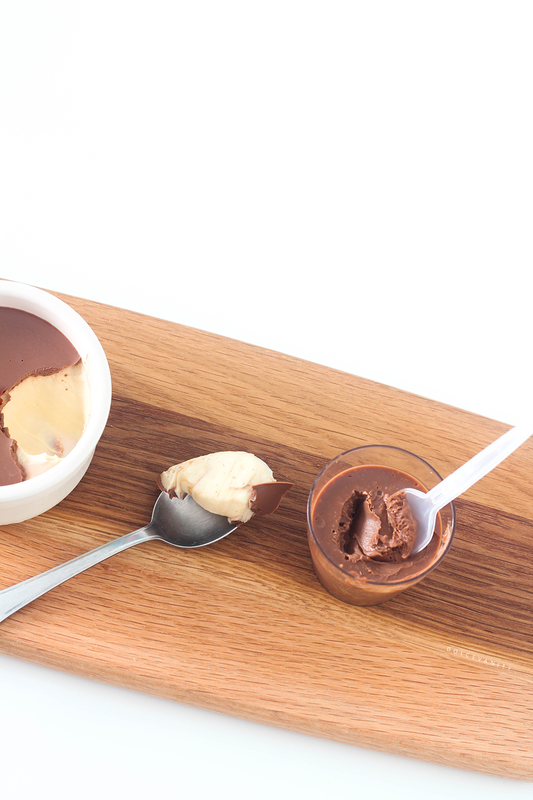 Vanilla & Chocolate Pot, a smooth layer of chocolate ganache set on a light Madagascan vanilla cream. The chocolate layer is unbelievably soft once you break into it and you cut into the vanilla cream. I absolutely adored this, I felt I was in an advert where you see the women fall softly into ecstasy with the taste. It's light and heavenly and I don't feel guilty eating them at all. I'm excited to be able to taste some others from the range. Ingredients : Cream Cheese (Milk) (26%) ^Cream (Milk), Skimmed Milk, Salt, Modified Tapioca Starch, Stabilisers: Xanthan Gum, Locust Bean Gum], Whipping Cream (Milk) (20%), Free Range Pasteurised Egg Yolk (11%), Sugar (11%), Double Cream (Milk) (9%), Water (8%), Whole Milk (8%), Dark Chocolate (5%) ^Cocoa Mass, Sugar Cocoa Butter, Emulsifier: Soya Lecithin, Natural Vanilla Flavouring], Cocoa Powder, Lemon Juice, Madagascan Vanilla, Gelling Agent: Pectin NH Nappage. These are ready to eat once taken from the fridge and taken out. They don't have to be eaten all in one go - if you can resist but they'll need to be eaten with a day of opening. I think if you wanted a little treat or felt for a snack you can simply reach for one of these especially if you're feeling a little on the lazy side and don't want to make dessert for after dinner. There's another good side about Pots & Co. the ramekins are made from a clay that does not contaminate air, water or the earth & our reusable. 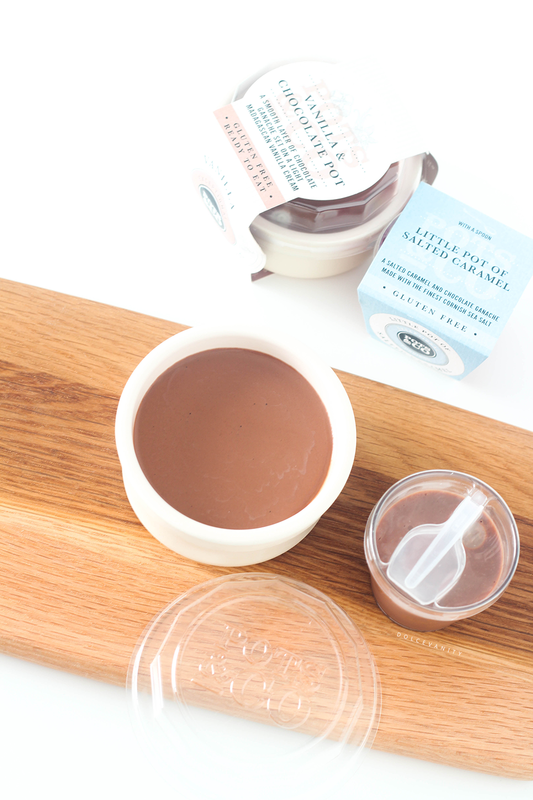 Pots & Co. products are suitable for vegetarians and gluten free. These are available to purchase at Ocado, Waitrose, Whole Foods, Harrods, Selfridges, Tesco & more. I'd love to know if you've tried Pots & Co.? Would you want to try them?